Did you notice a special page from Groupon Malaysia at www.love.groupon.my/letters specially designed for you, for him, for her and for them! If you notice from the section on “customize this message” you can personalized the letter with your desired message which will be generated by a unique link for you to present to a special someone! 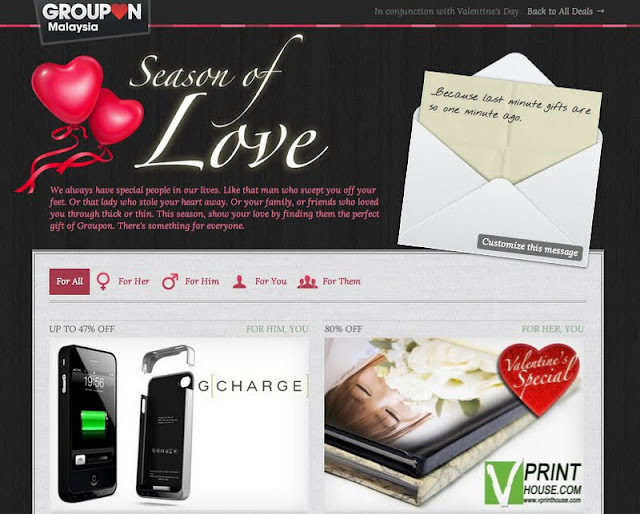 Just scroll till the end of the website from Groupon Malaysia Season of Love page here to write down your message at the message box and click done when your finished. A link will be generated at the mini link bar at the side in brown colour something like this link (http://love.groupon.my/letters/1l3ezd).Simple enough? You can also share your message to tag that special someone via Twitter or Facebook by clicking on the icons!A great idea if your not sure what to give that special someone, this digital love letter to helps you to share and express your feelings!